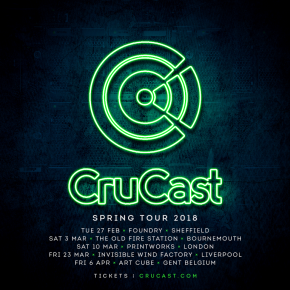 If Bassline is making its way back into the mainstream, you’ll struggle to find a more influential group in that development than CruCast, who embark on a UK tour next month as they head to Sheffield, Bournemouth, London and Liverpool. Featuring Skepsis, Darkzy, Notion, Mr Virgo, Bru-C and Lazcru, the nights will showcase plenty of chunk bass and high-octane rhythms. Things get underway on Tuesday 27th February, with Sheffield’s Foundry hosting the CruCast team in collaboration with The Tuesday Club, before Bournemouth gets a taste of the same on Saturday 3rd March. Printworks in London and Invisible Wind Factory in Liverpool follow suit later in the month, before a trip to Belgium sees CruCast sample the Belgian nightlife at Art Cube in Gent.